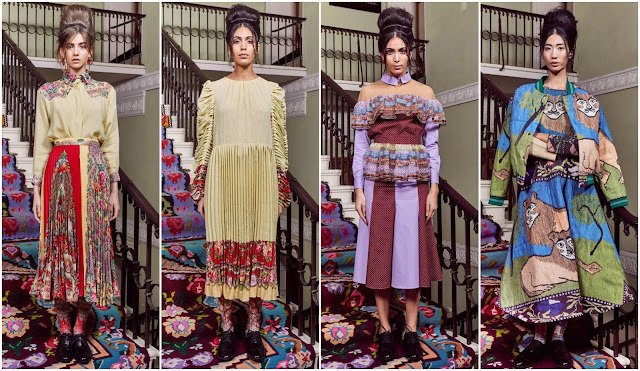 Identical sisters Tamara and Natasha Surgulazde have been designing Tata Naka, the label called after their respective childhood nicknames, for 18 years. The Georgian designers predate Demna Gvasalia and Vetements, and the rise of Tbilisi Fashion Week (heralded by Mr. Gvasalia). They don’t conform to the post-Soviet froideur that underscores the collections presented at Tbilisi Fashion Week, or to Gvasalia’s enraged politics of a youth in an oppressed country. Conversely, the Surgulazde’s work is jovial, joyous even. At the Theatre Royal, Drury Lane, during London Fashion Week in February, their models descended the steps on purpose-built Georgian kilims (woven tapestries) evoking the 1920s and 1930s in the form of figurative prints portraying the images of Red Army officers on horseback, two lions or deer. It was a celebration of Eastern European arts and culture. In the way that other Georgian designers respond to Russian influence with rigorous tailoring inspired by austerity, the Surgulazde’s looked to the shawls of Pavlovo Posad, a symbol of the Eastern Slavs artistic capabilities. Pavlovo Posad shawls feature elaborate designs and are typically rendered in wool. The designers infused this reference by emphasising the use of folk prints on dresses, taking something bordering kitsch and transforming it into something visually striking in a modern context—they applied the patterns to sleeves on lilac dresses, as peplums, and on polka dot shifts. The stronger looks were, in contrast to the way they used folk prints, the ones which recalled a bygone era. Slightly frumpy baby doll dresses had elongated hemlines, representing a conservative society, knife pleated sleeves were a nice touch and easily perceivable as daring considering their traditionally ladylike aesthetic. While they contribute something inherently feminine and wholesomely creative, what they don’t bring to the representation of Georgia in fashion, in the same way that other Georgian designers fall short, is creating a nuanced dialogue. Together with other Georgian designers, they make the whole story, but apart there is a disconnect comprised of many one-sided stories.